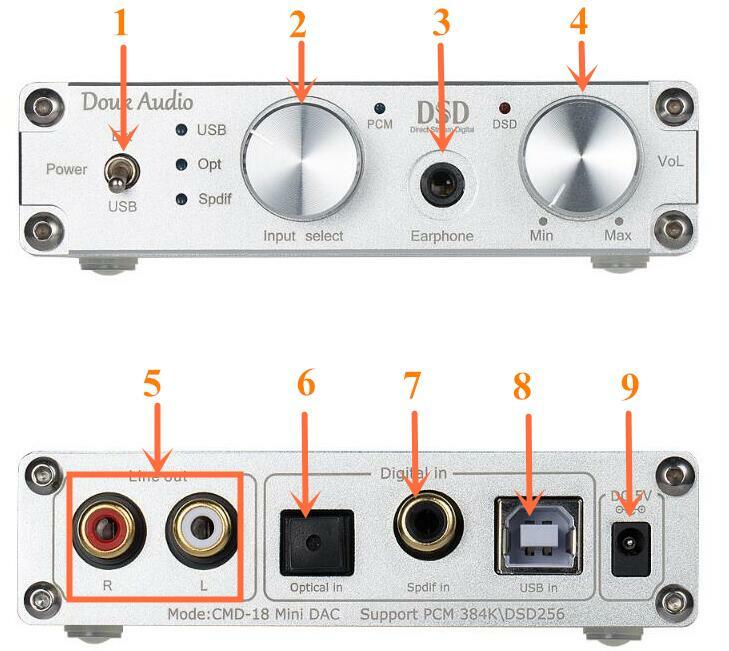 This is our Douk Audio Studio Upgraded version Mini USB DAC & HiFi Headphone Amplifier, with coaxial, optical digital input, which is very convenient to connect speakers to improve the sound effects. This sound card with USB connector ,very convinent to PC/Notebook,super mini and portable design. Using TI’S high-performance DSD1796 as the decoding chip(DSD Professional decoding chip,The lowest distortion is 0.0005% ) XMOS U208 as the USB part,with MCU control, automatically decoding DSD/PCM ,automatically transfer indicator light (DSD/PCM indicator) 3Set input decoding ,with coaxial 、headphone、linear output. It can play PCM、DSD64、DSD128、(native DSD256 ) Format music. 6.The latest breakthrough in USB audio decoding technology: XMOS XU208 asynchronous transmission, brings the signal transfer fidelity to a new height. 7.Texas Instrument top-performing DSD1796 decoding chip support both 384K PCM and DSD64-DSD256 formats, which allows you to enjoy mastering quality sound conversion. 11.Supported by Windows XP / Vista / 7 / 8.1 with driver installed (driver software provided with CD shipped. MAC and Linux do not need the driver. 13.USB Support Android (5.0 or above) with OTG function. You would need the OTG cable. Note: When DAC Only with Optical input (Opt), no matter the switch at Coaxial or optical place the signal is optical signal, Once plug the coaxial cable then you can select the matching decoding way. 8. USB IN: Using the USB2.0 digital cable to computer USB Port, Pls using the Double magnetic ring cable to avoid the noise. 9. DC IN: Connect the External power ,it must be 5V Current >0.5A ,PLS note the power polarity. 1. If the DAC only with Optical input signal ,no matter the selector switch at Coaxial or optical position it just the optical signal ,Once insert the coacial cable then have to select the matching input signal ,that not the device quality problem ,it is just the DAC Preferred signal mode issue. 4. If the device has a fast forward and no sound problem ,that caused by the USB Contact or power supply ,just inert the cable or change USB port is fine .